Have you noticed that veganism is on the rise? Whether it’s through changing menus with more vegan options or vegan-only frozen meals lining the grocery store freezer—it’s evident this trend isn’t going away any time soon. This is even felt in the in the at-home delivery food world. GrubHub, a popular food delivery service, released data claiming that customers who chose vegan food increased by 19% more in the first half of 2017 than the first half of 2016, citing an almost 20% increase. GlobalData claims there has been a 600% increase in people identifying as vegan in the United States in the last three years, and a 250% increase in the U.K, according to Vegan Life Magazine and Vegan Society. What is it about this plant-based diet and lifestyle that’s catching on so quickly? Celebrities that tout a plant-based diet consist of Miley Cyrus, Liam Hemsworth, Stella McCartney, and even Meghan Markle, who identifies as a “part-time vegan”, adhering to it during the week but giving herself some more flexibility on the weekends. Beyonce even does a “vegan challenge” every time she gears up for big events or performances. Prior to last year’s Coachella, she called on all of her Instagram followers to join her in such a challenge as she prepared for her performance. The hormones and ethics of eating meat is a problem for many, as are the environmental factors. Many scientists say milk proteins, milk sugar and milk saturated fat pose health risks towards obesity, diabetes, and heart disease. Dairy also causes significant digestive problems for many, citing lactose intolerance. Some studies have even suggested an increased cancer risk for prostate cancer, testicular cancer, breast and ovarian cancers through frequent meat and dairy consumption. Wherever you fall in the spectrum of these factors and statistics—they are hard to ignore. 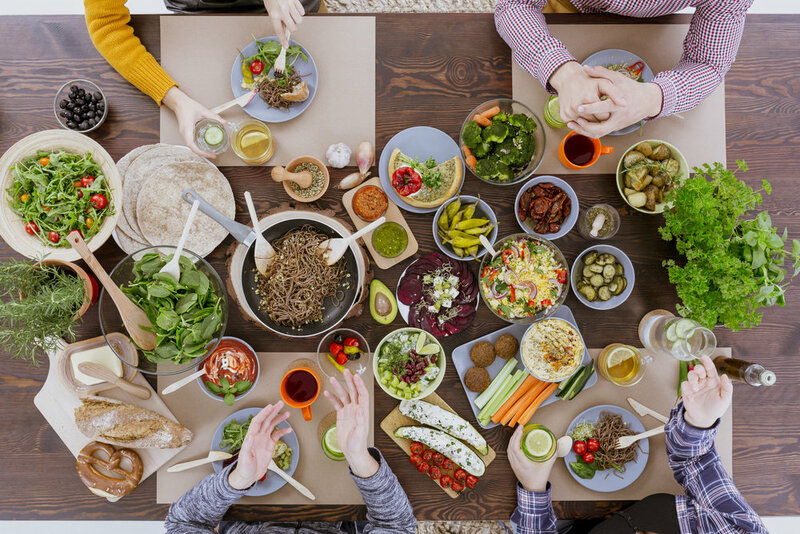 The New York-based restaurant consultancy firm Baum + Whitman claimed in a recent report that plant-based food will be “the food trend of 2018”. Similarly, the report also claims that plant-based foods will become the “new organic”. Alicia Silverstone, a prominent and outspoken vegan once said, “I can’t think of anything better in the world to be but a vegan,” showing that the diet is on the rise and no longer a fringe activity for fanatics. So what are important foods when approaching a plant-based diet for beginners? Let’s take a look at some plant based diet foods you can easily incorporate into your everyday diet, all providing essential nutrients for a well-rounded and balanced regimen. Vegans need to make sure to get enough protein, which is why chia seeds are a great plant-based source. They are 14% protein, actually, which is very high compared to other plants and can help in lowering appetite while being a healthy alternative to dairy or meat. They also have a great balance of vital amino acids. Similarly to flax seeds, chia seeds are rich in omega-3 fatty acids and actually contain more omega-3s than salmon per gram—which is really saying something since fish is known for its high amounts of omega-3s! Studies have shown that chia seeds, if milled, can increase blood levels of ALA and EPA, lowering your risk of heart disease while raising your “good” cholesterol. Chia seeds are great in oatmeal with non-dairy milk. They’re also a nice textural element to shakes and pair well with peanut butter—not to mention vegan puddings. Pure Green’s Coconut Hydrate—a cold-pressed juice sensation—consists of coconut water, pineapple, lemon and chia seeds, guaranteed to be refreshing while hydrating you with essential nutrients. Quinoa is all over menus these days and becoming more and more common with vegans and non-vegans alike. If you’re seeking a plant-based diet, you cannot go wrong with quinoa, as not only does it contain all of the nine essential amino acids, but it’s also gluten-free, meaning it’s easier on your tummy. Quinoa is a grain crop that is grown for its edible seeds that was known to be a crucial crop in the Inca Empire, referred to as “the mother of all grains”. It’s been eaten for thousands of years in South America and only recently has become trendy in the United States. It possesses 8 grams of protein—there we go again with high-protein plant-based food—with 5 grams of fiber all in just one cup. Quinoa has even gotten some accolades the past decade when the United Nations claimed 2013 “The International Year of Quinoa” because of its high nutrient content and overall contribution to world food security. Quinoa is often seen on menus accompanying salads, as it adds a variance of texture as well as protein. A breakfast quinoa with blueberries is a fantastic way to start your day and quinoa-stuffed bell peppers make a great appetizer at a dinner party. Lentils are rich in selenium, which is a mineral used in the prevention of inflammation, tumor growth, as well as disease-killing T-cells. It plays a role in liver enzyme function and helps detoxify some cancer-causing compounds in the body. A diet plentiful in lentils has even shown to be associated with a decreased risk of colorectal cancer. When it comes to vegan recipes, you can substitute lentils in place of beans in most dishes. Try replacing the meat in lasagna with red lentils for Italian night or mashing up cooked lentils in your food processor as a fun dip. We would be amiss not to mention fruit when talking about a plant-based diet, wouldn’t we? Thankfully, watermelon is 90% water, providing a great source of hydration for vegans. Pure Green’s “Pure Watermelon” cold-pressed juice consists of watermelon and lemon, proving to be a great resource when you’re needing a healthy way to quench your thirst. Watermelon juice can help improve the health of the circulatory system as well as ease hypertension. The fruit flesh is ideal for digestion and regularity because of its high fiber and water content and is jam-packed with electrolytes to keep vegans going. Watermelon is ideal for the skin because of its high Vitamin A content, which aids in sebum production, helping to keep hair and skin moisturized. Its Vitamin C content is great for building and maintaining collagen. It’s even a healthy snack when made into a popsicle! While many might feel avocados are vegetables, they are actually fruits and ideal for vegans with its high amounts of nutrients. Most vegans will tell you avocados are a delicious part of their plant-based diet with its high amounts of Vitamin K, B5, B6 and Vitamin E. Avocados contain no sodium and have more potassium than bananas! With this fruit being one of the fattiest on the planet, its high amounts of oleic acid contribute to reduced inflammation. Clearly, the benefits far outweigh the disadvantages when it comes to plant-based diets. In general, veganism is associated with less saturated fat and calories on the whole, making its followers’ chances of obesity much lower in comparison to those eating meat and dairy. Joaquin Phoenix claimed, “It takes nothing away from a human to be kind to an animal.” Naturally, this is felt all too often by those adopting plant-based diets around the world. Be patient with yourself as you embark on veganism, as it can be a real alteration for those unaccustomed to it. Start out slow by replacing your meat and dairy proteins with plant-based proteins until it becomes customary in your daily routine. Happy veganism! !